I am very excited to announce the publishing of my story in the Horse As Teacher: The Path to Relationship. This collection of short stories about horses is both inspirational and heart-warming and I am honoured to be a part of it. I have been tuning into the behaviour, spirit and body language of horses for over 10 years as a horse whisperer. I feel it is finally time to share with you what only the horses know! My horses have given me an incredible sense of empathy and intuitive knowing about myself and others. Horses have allowed me to finally find my own voice and speak out through my divine source. I wrote this story for each of you, so that you too can say what needs to be said and stop hiding. As women in the world today our calling is clear – our divine feminine is fully awake as never before and is yearning to be heard. Let me know how you like the story, and what it unlocks inside of you. I want you to join the dance of freedom and let your soul be inspired! I want you to fall unconditionally in love with yourself! This is the second book in a revolutionary new series that inspires readers to see not only the beauty of horses, but to understand horses’ natural ability to transform lives through relationship. My story in this volume was inspired by the courageous women that my herd and I have supported to live empowered lives. From front cover to back, this book will completely engage you, as a herd of 10 horsewomen from around the world share love stories about their horses. You will laugh, cry and be transported into the unconditional love of horses and their spirit! This is the perfect gift for anyone who wants to immerse themselves in a beautiful collection of stories of healing, self-discovery, wisdom, personal power and strength. You will identify with these stories of pure horse joy. 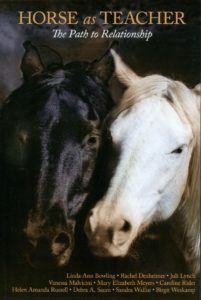 As you turn each page, your heart will embrace the love that is shared between woman and horse. To purchase the book online, visit www.amazon.ca. For offline purchase, ask for it at Chapters/Indigo.